Our homeschooling group took a field trip to The Stone Camp which is this guy's house way out in the middle of Nowhere-ville, PA This guy, Ted, lives completely off the grid. He makes his own fuel, electricity, food, and everything. It is a pretty awesome place to visit. So we take the tour and then we are all kind of just wandering around looking at things and gathering children to head to the cars. During this time I get a bit distracted and Margaret decides that it would be a good idea to feed this guy's rooster. Well, said rooster apparently doesn't like little girls in rainbow skirts because he attacks Margaret and pecks her right in the head. Hard enough to puncture the skin and she is bleeding and crying and the boys who witnessed the attack are excited and animated and describing it to several adults and about 15 of the kids. I am trying to get my kids to the car and deal with Margaret who is still bleeding from her head when Ted appears and is very concerned about what happened. Since I didn't see the event, I am very apologetic and state how I am sure she is fine and just scared, and I should have been watching her, etc. Ted looks at her wound and states, "That's it for the rooster." He then picks up a large stick and goes to deal with his rooster. I decide it is now a great time to get to the car and I push my children in that direction. A few minutes later one of my friends appear who didn't know about the attack and she says, "I think Ted has had it with his rooster. I just saw the rooster run by and Ted was chasing it with a club." That, my friends, is how folks who live off the grid deal with unruly roosters. 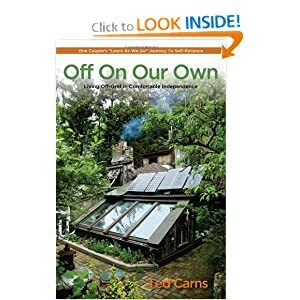 Ted has written a book about his experience living off the grid. I don't own it, but several folks on the field trip purchased it. It probably neglects to mention anything about rooster management. Sorry for your little girl's injury...I hope she heals fast. I feel kinda bad that that I'm cracking up right now, but that really is a funny story! Don't feel bad laughing about this. I was laughing so hard my stomach hurt. And I laugh every time I tell the story. We call all use a good giggle now and then!